We are engaged in offering a quality range of Aluminum Caps Closures. These closures are available in different diameters such as 28 mm x 18 mm & 28 mm x 22 mm as per the emerging demands of the clients. We make sure that these products are available at the most affordable prices to our esteemed customers. 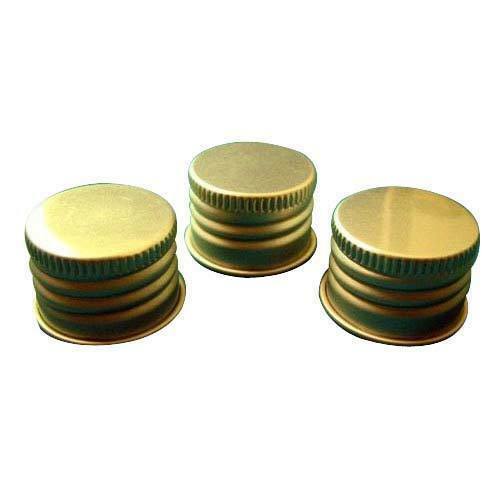 Moreover, the products that we offer are plain and printed caps in various colors suitable to the bottle. Offered at competitive prices, our range is widely acclaimed by clients for its tough design. Established in the year 1989, we, “Rishiraj Industries”, are a reputed firm engaged in manufacturing, supplying and exporting a wide range of Aluminium & Tin Container Caps and Seals. The products offered in this range are Container Seal, Tin Bottle Seals, Metal Crown Cap, Crown Caps, Tin Bottle Closures and Tin Closures. Additionally, we also offer Screw Bottle Cap, Aluminium Vial Seals, Aluminium Seals, Aluminium Cap Closure and Aluminium Bottle Closure to our esteemed customers situated all over the world. The products offered by our organization are highly appreciated by our clients for their ability to provide leak-proof and well-sealed packaging to different containers and bottles. Moreover, corrosion resistance, tamper proof sealing and high strength are the striking features of our range, owing to which it is widely demanded for packaging pharmaceutical products, food items and pest control chemicals. The products that we offer are manufactured using superior quality aluminium and other raw material, which is procured from the trusted vendors of the market. Owing to our vast distribution network, we have been able to earn huge client base across the major markets of the Indian Subcontinent.